The 2018 Toyota Tundra casts an air of aggression that demands your attention. 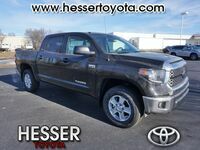 With a tough exterior wrapping around an inviting and comfortable interior, the 2018 Toyota Tundra is ready for work or play. Providing you with all the power you need to get the dirty work done the 2018 Toyota Tundra also has the agility to dance through the roughest terrain. Whether taking the crew and all of the gear to the jobsite or to the Sunday tailgate, the 2018 Toyota Tundra offers dependable versatility. 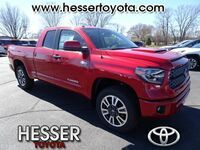 All of the 2018 Toyota Tundra’s toughness and reliability provides you with the peace of mind that when it’s time to get to work the 2018 Toyota Tundra is ready and able. 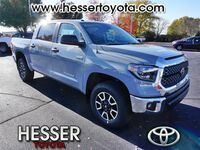 Once the leaves start falling, work begins to pile up, get the best work companion on the market with a new 2018 Toyota Tundra from Hesser Toyota in Janesville, Wisconsin. The chart above depicts the key performance, technology and safety features of the 2018 Toyota Tundra. The 2018 Toyota Tundra can also be equipped with a 5.7L i-Force V8 engine that rips out more horsepower (381) and torque (401) than the standard 4.6L V8. Both engines are paired with a 6-speed electronically controlled automatic transmission, and Tow/Haul mode comes standard with the 5.7L V8 engine. With Tow/Haul mode the 2018 Toyota Tundra gets equipped with an integrated trailer brake controller, transmission fluid temperature gauge, supplemental engine oil and transmission cooler and a heavy-duty battery. 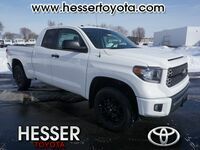 With the 5.7L V8 engine and the Tow/Haul package the 2018 Toyota Tundra has a maximum towing capacity of 10,200 pounds and a max payload of 1,730 pounds. Getting all that weight behind you moving is easy, but bringing it to a stop is the most important thing and with the 2018 Toyota Tundra’s huge 13.9” ventilated front disc brakes and 13.6” rear ventilated disc brakes you can hit the brakes in complete confidence. Adding peace of mind to everyday driving is the standard Toyota Safety Sense which includes a Pre-Collision System, Pedestrian Detection, and Lane Departure Alert w/ Sway Warning System. These safety systems are constantly monitoring the 2018 Toyota Tundra’s surroundings and alerting the driver to any possible problems. 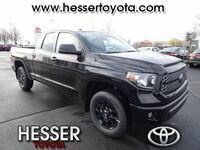 The 2018 Toyota Tundra is an excellent addition to the Toyota lineup and is arriving in time to help you get all your work complete so you can tailgate at the game on Sunday.